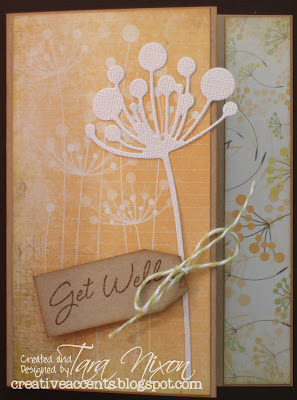 We had a fun time at our Occasions Card Class on Monday night, creating some Get Well cards for our stash! Today I'm sharing with you 2 of those cards... I'll be back soon to share 2 more with ya! 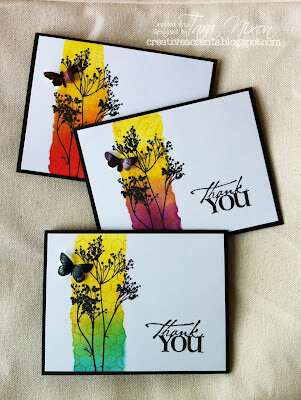 All four cards we created feature the new "Good Day, Sunshine" collection from We R Memory Keepers. This collection just arrived in the store and it called out for me to create with it ;) It's a springy version of one of my favourite colour schemes, and let me tell you... I'm ready for spring! This collection is not available in 6x6 pads, but we have 2 different 12x12 sheets which feature 6x6 patterns on the back and for the most part, those are what we used for this class. 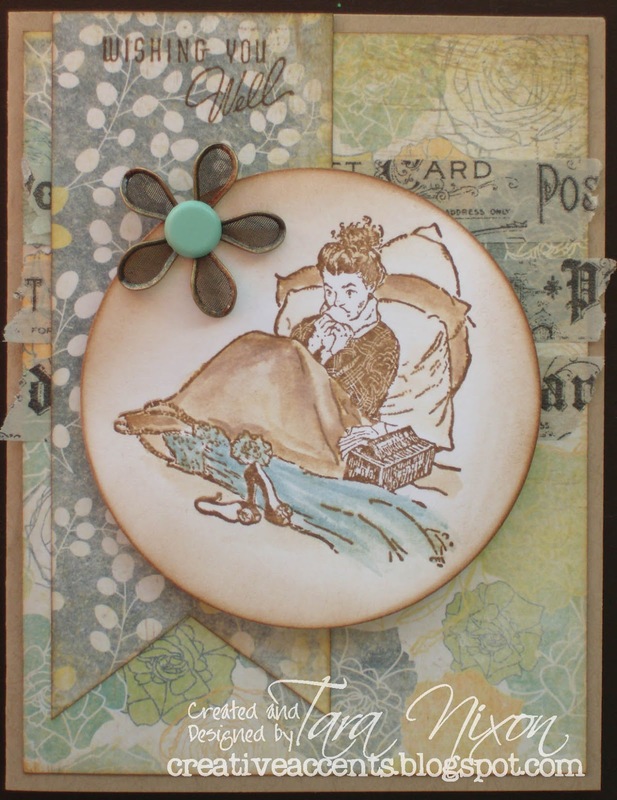 This first card was inspired by the current 'deconstructed sketch'... Love it! We coloured our image (no longer available- from Cornish Heritage Farms) using Distress Ink for a vintage feel. It's simply embellished with some tissue tape (Tim Holtz) and a fab little metal flower & brad, also from We R Memory Keepers. This second card was very simple, but I love how it turned out. We trimmed 1" from the edge of our card and added a coordinating patterned paper along that inside edge, added a die cut (QuicKutz) and a simple tag (yep, we used that 1" piece we trimmed off!) with a Hero Arts stamp. 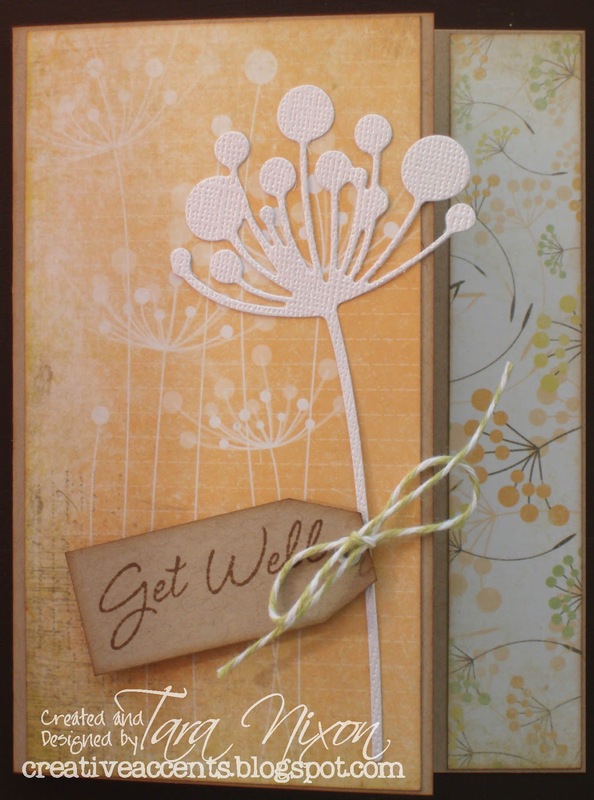 An eyelet and some twine finish this sweet card off. Doesn't it look like the die and those papers were made for each other!? Love it when that happens! Hope you enjoyed my cards and that you're feeling well today! Beautiful work! I love how you trimmed the 1-inch off the side of your card,and how everything coordinates,even tho' they are from different companies.Thanks for sharing! Great cards, love that image and the colours of both the cards. Tara, this is a beautiful card! Love those papers and that cool flower. Thanks so much for joining us at the Deconstructed Sketch this past week!